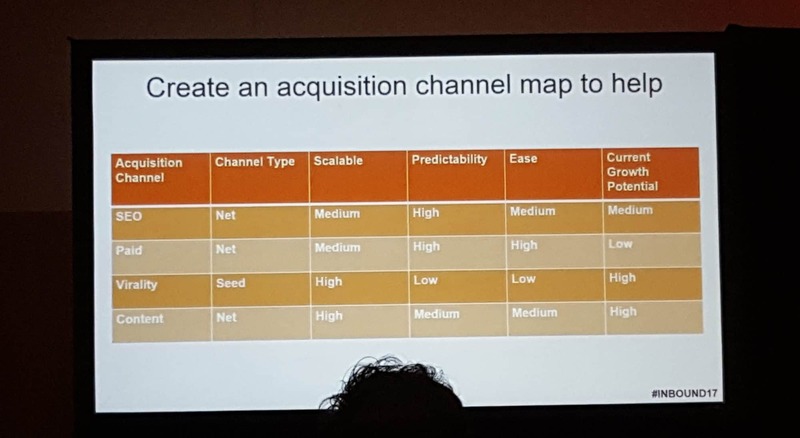 Kieran Flanagan from HubSpot shared the strategies used by his growth team to grow HubSpot revenue as quickly as possible. HubSpot has been forced to change their marketing tactics in order to achieve a new level of scale. Every company eventually reaches a point where their marketing tactics become a limiting factor. In his Inbound 2017 session, Kieran Flanagan explained how HubSpot is adjusting its tactics to continue its growth. For HubSpot, content was always the “bell cow”. In other words, Hubspot marketing leaders could predict that if they continued to grow their content base and keep quality the same, they would be able to hit their growth goals. But that situation has changed in recent years. They have larger quarterly expectations than ever before, and content will only be able to contribute to part of this goals. Every business eventually hits this plateau. They set an aggressive growth goal, and then try to execute the same marketing campaigns that helped them reach their existing amount of annual revenue. This will help you achieve… the same results as the previous year. So, Kieran has taken charge of building the “freemium” growth strategy for HubSpot. HubSpot has a growing suite of free products that they use to attract users. If a user “activates”, or completes a specific action in the product, a sales team member can reach out about upgrading to a paid version. But, most users will try their products once and never come back, or stick with the free version. Still, they can onboard hundreds of thousands of users due to HubSpot’s massive reach. 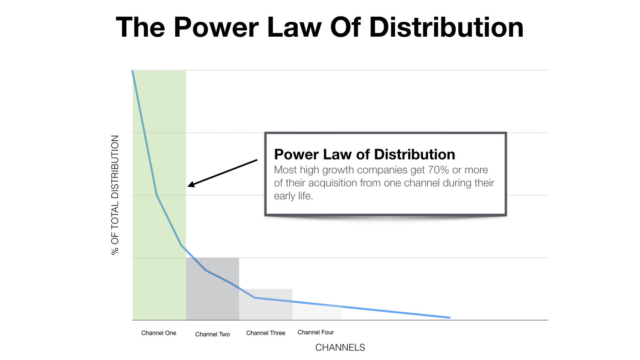 Kieran calls this the “growth power law“. At any given point, a business can expect that 70% of new customers will come from one specific marketing channel. Kieran shared a few examples of popular products and their tactics for growing rapidly via the growth power law. Pandadoc is a sales enablement tool that helps salespeople keep track of all documents needed to close a deal. Pandadoc has had one big driver of customers- their template library. Pandadoc has created hundreds of templates for documents that salespeople in different industries commonly require. So, if you search “marketing agency scope of work document” or similar, you may find Pandadoc as a top result. This helps them instantly get in touch with prospects in need of their services. Intercom is a chat tool that you can use to instantly get in touch with a customer support team member. You have probably seen it on the bottom right of many websites. Since they exist on so many pages across the web, they were able to spread via viral growth. There is a little statement- “Powered by Intercom”- in every chat window. So anyone that uses their chat gets instant exposure. HubSpot’s original strategy centered around content. Once they found that content marketing generated reliable returns, they went far beyond the HubSpot blog. They created the inbound.org community, the ThinkGrowth Medium publication, and the Growth Show podcast. This helped them expand the brand while continuing their content strategy. Now, they have free versions of their CRM and Marketing product. They bring in multiple audiences to these products. They know that 40-60% of users will log in once and never come back. But since they are able to reach such a large scale, they can grow via users that convert to paid accounts. Kieran introduced three types of tactics for growth: spears nets and seeds; a framework Aaron Ross first shared in his book, Predictable Revenue. Spears are tactics that allow you to target individual buyers. Sales prospecting is a good example. Nets are tactics that allow you to reach a wide audience, and will convert a small percentage. For example, content marketing. Seeds are tactics that will start small, but create viral loops and grow organically over time. Freemium is a good example. Kieran encourages the audience to find the one metric that will determine a customer or user. For example, in a freemium product, what is the one action a user needs to take in order to get hooked? If you sell an enterprise product, what is the one metric that measures engagement and consistent use of the product?